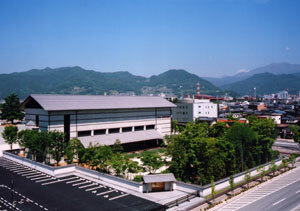 The Mizuno Museum is an art museum of modern Japanese-style paintings established on the long-time collection gathered by the president of the Hokuto Corporation and opened in 2002. It introduces the excellent works of artists who played important roles in the Japanese art history in seasonally changed regular exhibitions and special exhibitions twice a year. It also houses a restaurant with the gorgeous view of the Japanese garden. Approx. 7 km from Nagano IC, or approx. 10 min. ride on the bus to Nisseki- Mizuno Bijutsukan from JR Nagano station East Exit, get off at the final stop. Mondays (following days when holidays) and Exhibition changing days. Long closing period in December. General 800 yen, Junior high and High school students 600 yen, Elementary school students 300 yen (Special fee applied for special exhibitions) *Admission free for Elementary/Junior high schools in Nagano city if using as a part of their curriculums. *Admission free for Elementary/Junior high school students in Nagano city on Saturdays. *Half price for anyone with hadicapped person's passbook and people wearing kimono.